Here is my finished orange peel snowflake quilt! I'm really happy with how it turned out. 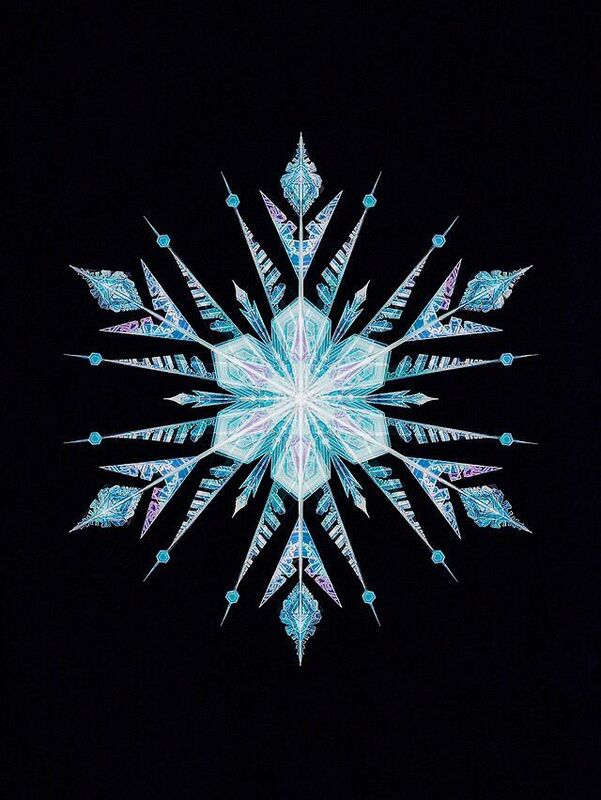 I came across this snowflake from Frozen and moments later saw this lovely Joseph's coat quilt and they merged in my mind and I knew I had to make it. I really enjoyed the quilting on this, even if the pebbles got a little tedious. I used Aurifil #2600 (dove) around the petals and #4241 (very dark grey) on the background. I used Dove in the bobbin around the snowflake so it would stand out on the back, and then #2545 (medium purple) in the bobbin for the pebbles. The fabrics used are Carolyn Friedlander's Crosshatch in grey for the petals, Moda Bella Charcoal, Kona purple on the back and Kona Black for the binding. Quilting detail--pebbles with a few snowflakes in them. I used Quilter's Dream wool batting for the first time--I got it off Massdrop about a month ago after hearing such good things about it. Well, I have a mild wool allergy and did not like the feel of laying it out and cutting it. Also it sheds a lot. But it quilted beautifully and has a nice loft. Next time I will pair it with some Warm and Natural for stability. I love how the petals stand out from the rest of the quilt! The petals/peels measure 3" x 3/4". This quilt was a fun break from commissions, swaps and pay-it-forwards. It's been a while since I made a quilt for myself, purely for the sake of enjoying the process! Back snowflake detail. I need to figure out a nicer method for frequent start/stops when the backtracking is glaringly obvious. 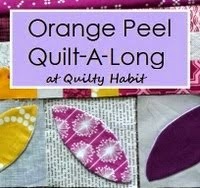 I'm linking up with Quilty Habit's Orange Peel Along--go check it out to see more orange peel quilts! And starting September 9th you can vote for your favorite! Again...Pretty amazing! Nice work on the quilting. So pretty! I love the extra dimension your quilting has given the snowflake. That is so beautiful and elegant. I wasn't sure at first about your brighter thread but I'm the one who was wrong. It puts together the snowflake and add unity to it. I admire your perfect thread tension between the front and the back. That thread is amazing. I don't think it looks bad on the back at all! If I wasn't a quilter I probably wouldn't have even noticed. :) Thank you for participating! I'm glad you had so much fun making something for yourself (which we all need!). This is gorgeous! Wow! You do amazing work! Looks great! I love the back of your mini which is just fab! Your quilting is always very inspirational. Renee it's beautiful! I love your colour choices and your quilting. If you want the beginnings and endings to become almost invisible you can always carefully knot and bury your ends, making sure your starting and stopping points meet exactly too. This takes much more time than reverse stitching or lock stitching but will give you a neater finish. I have a couple of photos of knotting and burying on my Christmas in August post if you are unfamiliar with this. That is beautiful! What a great idea to turn the orange peels into a snowflake! Hi Renne! Your quilt s stunning! This is the first time I'm visiting you. I didn't know about your blog before. So, thank you for stopping by my blog! Coming here was also a pleasant visit! Beautiful, and the quilting is just perfect too. Fabulous.Love The 3D effect.And as always tour quilting caught my eye.Have a fun day! This turned out so well, Renee! The orange peel even seems to pop from the quilting on the back of the quilt too! Love this finish and am inspired on your unique use of those orange peels. I can't stop scrolling up and looking, you've done an astounding job on the quilting as always Renee! Where do we go to vote? Quilty Habit? Congratulations on winning the Viewer's Choice of the Orange Peel QAL! They were all pretty but yours was unusual and one of a kind.